At age seven, Gloria Strauss received a dreadful diagnosis: She had terminal cancer. It was not news to her, however, merely confirmation of what God had told her mother a few days earlier. "Your daughter will have an incurable disease," He said. "When I heal her, I will change the lives of many." Instead of living in fear of death, the child carried on with an expectant faith, declaring to all she encountered that she would be a miracle. Four years into her struggle, with doctors predicting she only had weeks to live, Gloria made headlines when Jerry Brewer, a sports columnist for The Seattle Times, stumbled into her life. Expecting to write a column about Gloria's father, a high school basketball coach, Brewer wound up being mesmerized by the Strauss family's steadfast Catholic beliefs. The grandson of a Baptist minister, he had respect for the intensity of such a faith, but since he had strayed from the church during his adulthood, this story of a lifetime turned into a life lesson. Brewer followed the family of seven children for five months, witnessing religion and cancer colliding, watching Gloria inspire believers and non-believers to unite, re-evaluating himself along the way. What he learned is described in this book, embedded within a tale that alternates between chilling and heartwarming almost by the paragraph, with hope obstructing the deadly disease. 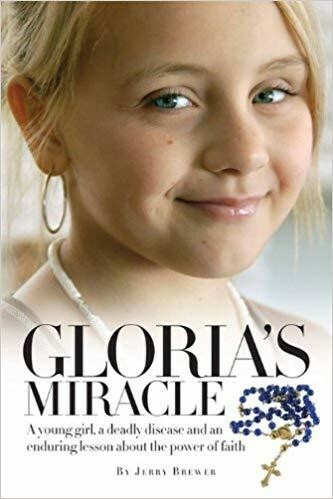 Gloria's Miracle is a true story about how much you are willing to sacrifice to believe in God, in yourself, in true happiness. It is about family, community, choices, dreams and, especially, love. By the end, the vast concept of a miracle is whittled down to its poignant essence.